Nearly all Chinese travellers (91%) would be more willing to shop and spend at overseas merchants that accepted Chinese mobile payments, according to a new Nielsen report, jointly released by Nielsen and Alipay, which found that 93% of Chinese tourists would use mobile payment overseas if given the option. The findings, revealed in a new Outbound Chinese Tourism and Consumption Trends: 2017 Survey, the first of its kind and examines the latest trends in Chinese tourists’ overseas travel and spending, and their use of mobile payment platforms when travelling. 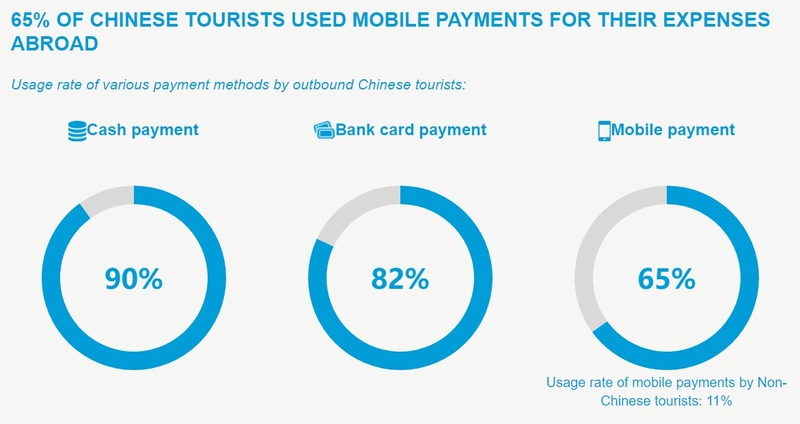 About 65% of Chinese tourists that participated in the survey have used mobile payment while traveling overseas, compared with only 11% of non-Chinese tourists. Shopping was ranked the number one category for Chinese tourists spending overseas (25%) over accommodations (19%) and dining (16%). Non-Chinese respondents ranked shopping third (15%) in favor of spending on accommodations (29%) and dining (18%). Statistics from the China National Tourism Administration show that Chinese tourists made 131 million trips overseas in 2017, an increase of 7% from 2016. The International Association of Tour Managers estimates that Chinese tourists spent $261.1 billion on overseas travel in 2016, up 4.5% from the prior year and ranking these tourists first worldwide in terms of spending on overseas travel. Alipay is China’s leading online payment provider and the primary means of online and mobile payments for Chinese consumers. Beyond an improved payment experience, Alipay offers a sophisticated marketing channel. Through Alipay, merchants are able to market to Chinese tourists before, during and after their visits, boosting exposure of their businesses among China’s rapidly expanding overseas visitors. To read additional findings from the Outbound Chinese Tourism and Consumption Trends: 2017 Survey, please click here.